Muktasree Chakma Sathi: To be honest , I am actually glad to see indigenous youths started talking about so called “indigenous-friendly” non indigenous men whose targeted girlfriends were always indigenous girls (due to their fantasy regarding indigenous girls aka hilly chicks). There are such type of people whose perverseness or allegation against them, we tolerated for long as we were thinking, “but he works for us, our rights”. We must learn to call- a spade a spade. Any men violating any girls IS NOT JUSTIFIED despite of his contribution/title/ political identity/family reputation. Yes, I am pro choice. I am in favor of love. I would /had stand by those couple who fall in love through MUTUAL CONSENT and RESPECT. But I would not stand by those couple who disrespect their partner’s identity and force their partner to change their religion /identity and habits in the name of “SOCIAL ACCEPTANCE/ RELIGIOUS OBLIGATION”. If you can fall in love with indigenous girls , you better not change her indigenous identity at any time , at any cost. Dear girls, in the name of love / social denial stop changing your identity. You owe that to your community, to yourself. Respect yourself. if your partner says you have to change your religion , your identity than PLEASE NOTE, HE NEITHER LOVES YOU NOR RESPECTS YOU. ‪#‎Maybehedoesnthityou‬ but he is an oppressor. He is using the “superiority card” against you, because he is a moron and believes your identity is dispensable. Doesn’t matter whether you already had physical relation with him or not. Doesn’t matter how much you love him, doesn’t matter whether your society will be with you or not. Love yourself. Keep your head high. You loving someone doesn’t make you vulnerable. It is you disrespecting yourself , MAKE YOU VULNERABLE. There are people who will stand by you and fight for you, reach them. Contact them, be friends with them. Walk out from abusive relationships doesn’t matter how old /young your are. It is not your shame. SHAME ON HIM WHO DISRESPECTS YOUR IDENTITY BUT SAYS HE LOVES YOU. SHAME.ON. HIM. P.S :the saddest part is , few of us were raising this concern for so long…. but most leaders of the society has a tendency to overlook feminists` concern. They think we always exaggerated things. SHAME ON THEM AS WELL. 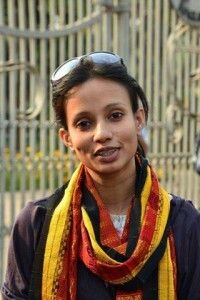 Muktasree Chakma Sathi is a rights activist, researcher, columnist and feminist, working for the rights of minorities, particularly the rights of women, children, and Indigenous peoples. The issues of sexual orientation and gender identity, as well as peace and security are key focus areas of her work. She has a keen interest in issues relating to multiple identities as she comes from a culturally diverse family and household where different cultures and ethnicity harmoniously coexist and interact. She grew up resisting those who questioned her culture, her identity and the purity of her blood. She grew up fighting all bullies who oppress and intimidate the vulnerable and voiceless. You can follow her in twitter @SathiChakma. All articles of this site is writers own views and the writer wholly contains the liabilities of the article. Women Chapter will not bear any responsibility regarding this. Please do not copy the content without proper permission. Next Article What Really Matters? Women Chapter turns 5 years old today!